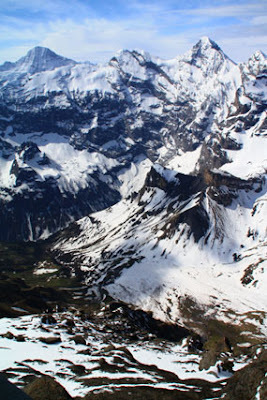 On arriving in Switzerland we drove to Lauterbrunnen, a delightful town in the Jungfrau region of the Swiss Alps. We checked into Hotel Silberhorn, and with no elevators, carried luggage to our fourth floor room. Actually, parking in back of the hotel is on the third level, so it wasn’t really too hard. The hotel is located on a hill, so I’m glad we were used to walking around Austin (central Texas is known as The Hill Country). Although it was small by American standards, the room was comfortable, featuring a private balcony and bath and free wi-fi. A/C isn’t needed—just open windows. Public spaces in the hotel are filled with interesting antiques, but our room had modern furnishings—clean lines to fit small spaces. There was a large banquet room and two dining rooms with reserved tables for all guests (same table each evening). Included dinner at the hotel was a massive five-course affair (salad, soup, cheese, fish, and dessert, for example), with great service and beautiful table settings. 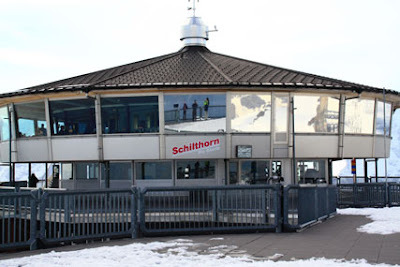 The next morning I woke to sounds of birds singing, the perfect start to our outdoor excursion to Schlithorn for breakfast at the world’s first revolving mountain restaurant, Piz (Peak) Gloria. 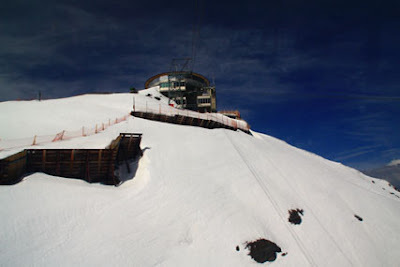 We met Romy Thommen, our guide from Jungfrau Region Marketing, at 6:45 a.m. for a ride on the large cable car to Grutschalp (4875 feet elevation). 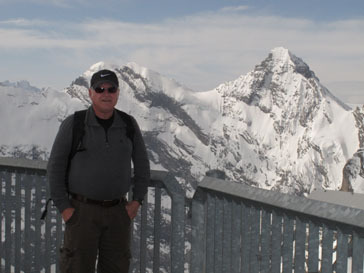 We then took the train to Murren and changed to a gondola at Brig, which we rode up to Schilthorn. Thank goodness we had Romy to show the way. Snow-covered mountains surrounded the gondola as we approached Schlithorn and a seemingly small building set on the peak. It was chilly but not cold, with patches of sunshine providing bursts of warmth. Only about a dozen people were at the top early on this May morning, although it’s typically packed in July and August. The restaurant was started in 1968, but developers ran out of money and needed investors. Luckily, Hollywood came calling—looking for a location for the James Bond movie, “On Her Majesty’s Secret Service.” The movie people finished the restaurant in 1969, blew it up, and then rebuilt it. It’s now a popular tourist attraction that uses the number 007 in many ways to get visitors’ attention. A video from the movie shows scenes of actors skiing down Schlithorn from its 10,000 foot peak. Breakfast was a glorious affair: a champagne toast, then hot tea, scrambled eggs and bacon, breads and pastries, waffles, dried meats, and canned fruit and jams. As we consumed this hearty meal, we stopped occasionally to look at the ever-changing view outside our windows. On a clear day, 200 mountain peaks are visible from the restaurant—from Mt. Titlis south of Lucerne along the Bernese Alps to Mont Blanc and across the lowland plains to the Black Forest of Germany. After breakfast, we bundled up and walked outdoors onto the terrace to see a spectacular 360 degree panorama of the alpine scenery. Patches of snow and ice remained—it wasn’t quite summer—but overall we had remarkable views of the mountainous region. Larry enjoyed the view from the terrace. On our return, we stopped at Murren and watched people paragliding—sailing off the side of the mountain with their oval parachutes catching wind drifts to keep them afloat. Built on a rock ledge, Murren is a perfect spot for launching into the wind. After a quick lunch of cheeses, dried meats, and garlic bread we took an hour-long hike to Grundswalt. Hiking trails for all abilities criss-cross the region, providing the perfect way to appreciate crisp, clean natural scenery that’s a hallmark of the Swiss Alps—in any season.